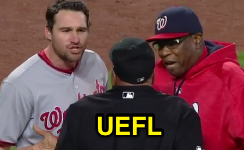 HP Umpire Laz Diaz ejected Nationals 2B Daniel Murphy (strike three call) in the bottom of the 9th inning of the Nationals-Orioles game. * With none out and one on (R2), Murphy took a 3-2 fastball from Orioles pitcher Mychal Givens for a called third strike. Replays indicate the pitch was located off the outer edge of home plate and thigh-high (px -1.049, pz 1.870 [sz_bot 1.565]), the call was incorrect. At the time of the ejection, the Nationals were leading, 4-2. The Orioles ultimately won the contest, 5-4, in 12 innings. This is Laz Diaz (63)'s first ejection of the 2017 MLB regular season. Laz Diaz now has -3 points in the UEFL Standings (-1 Previous + 2 MLB - 4 Incorrect Call = -3). *Murphy struck out in the top of the 9th, but was not ejected until after the bottom half of the inning. This is the 32nd ejection report of 2017. This is the 12th player ejection of 2017. Prior to ejection, Murphy was 1-3 (SO) in the contest. This is Washington's 1st ejection of 2017, T-2nd in the NL East (MIA 4; PHI, WAS 1; ATL, NYM 0). This is Daniel Murphy's 1st ejection since April 27, 2014 (Seth Buckminster; QOC = N [Balls/Strikes]). This is Laz Diaz's first ejection since May 9, 2016 (Jeff Banister; QOC = N [Balls/Strikes]). Wrap: Washington Nationals vs. Baltimore Orioles, 5/9/17 | Video via "Read More"